RELIGION OF PEACE, OR VIOLENCE? One may think that being an ancient text, Islam would have changed its view about women in the intervening years. NO WAY ! Riyadh – A Saudi judge has told a seminar on domestic violence that it is okay for a man to slap his wife for lavish spending, a local newspaper reported on Sunday. Jeddah judge Hamad al-Razine gave the example of overspending to buy a high-end abaya, the head-to toe black shroud Saudi women have to wear in public, as justifying a smack for one’s wife, Arab News said. “If a person gives 1 200 riyals ($320) to his wife and she spends 900 riyals ($240) to purchase an abaya from a brand shop, and if her husband slaps her on the face as a reaction to her action, she deserves that punishment,” he said. The judge’s remarks sparked an outcry at the seminar on the role of judicial and security officials in preventing domestic violence, the paper reported. The seminar was attended by officials as well as activists on domestic violence, including representatives of the National Family Safety Programme. Razine acknowledged the depth of the problem of domestic violence, until recently not acknowledged as a serious issue in the ultra-conservative Muslim country, where family problems traditionally remained behind closed doors. Saudi women have in the past few years become more vocal about the problem of husbands beating wives and fathers mistreating children. But Razine said some of the blame must be shouldered by wives for their behaviour. “Nobody puts even a fraction of the blame on them,” he said, according to the report. Justice is not supposed to be “empathetic” as President Obama has said, Just ice is supposed to be blind. The law should be viewed objectively. That is the idea behind the United States Supreme Court motto “Equal Justice Under Law.”These words,written above the main entrance to the Supreme Court Building, express the ultimate responsibility of the Supreme Court of the United States. It is also symbolized by the blindfolded statue of Lady Justice which is the symbol of the US judiciary. There are biblical echoes in the wording of that oath – a reminder that the judge’s obligation to decide cases on the basis of fact and law, without regard to the litigants’ wealth or fame or social status, is a venerable moral principle. Elsewhere they are reminded that it is not only the rich they are forbidden to favor. “Neither shall you be partial to a poor man in his dispute,” Exodus firmly warns. Judges may not bend the law, not even to help the underprivileged. Without judicial restraint there is no rule of law. We live under “a government of laws and not of men” only so long as judges stick to neutrally resolving the disputes before them, applying the law, and upholding the Constitution even when doing so leads to results they personally dislike. That is why the judicial oath is so adamant about impartiality. That is why Lady Justice is so frequently depicted – as on the sculpted lampposts outside the US Supreme Court – wearing a blindfold and carrying balanced scales. And that is why President Obama’s “empathy” standard is so disturbing, and has generated so much comment. But such cardiac justice is precisely what judges “do solemnly swear” to renounce. Sympathy for others is an admirable virtue. But a judge’s private commiserations are not relevant to the law he is expected to apply. If Obama means what he says, he wants judges who will violate their oath of office. With such criteria, what would remain of the rule of law? What would happen to “Equal Justice Under Law,” which is carved above the Supreme Court’s entrance? What would be left of the 14th Amendment’s guarantee of “equal protection of the laws” to every citizen? 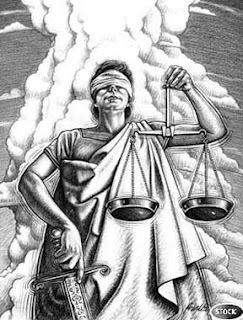 Lady Justice wears a blindfold not because she has no empathy for certain litigants or groups of people, but because there is no role for such empathy in a courtroom. “Our constitution is color-blind,” wrote Supreme Court Justice John Marshall Harlan, in his great dissent in Plessy v. Ferguson, “and neither knows nor tolerates classes among citizens.” Harlan had supported slavery; he believed whites were superior to nonwhites. He had his empathies, but he confined his judging to the law.